A journey that will stretch millions of miles and take years to complete begins with a short trip to a loading dock. The first of five instruments for a spacecraft that will collect a sample from an asteroid and bring it back to Earth has arrived at the Lockheed Martin Space Systems facility in Littleton, Colorado, for its installation onto NASA’s Origins Spectral Interpretation Resource Identification Security-Regolith Explorer, or OSIRIS-REx, spacecraft. Led by the University of Arizona, OSIRIS-REx is the first U.S. mission to fly to, study and retrieve a pristine sample from an asteroid and return it to Earth for study. Scheduled to launch in September 2016, the spacecraft will reach its asteroid target in 2018 and return a sample to Earth in 2023. The mission will allow scientists to investigate the composition of material from the very earliest epochs of solar system history, providing information about the source of organic materials and water on Earth. The OSIRIS-REx Thermal Emission Spectrometer, or OTES, will conduct surveys to map mineral and chemical abundances and to take the asteroid Bennu’s temperature. OTES is the first such instrument built entirely on the Arizona State University campus. OTES is one of five instruments from national and international partners. These instruments will be key to mapping and analyzing Bennu’s surface and will be critical in identifying a site from which a sample can be safely retrieved and ultimately returned to Earth. The instrument will be powered on shortly after the OSIRIS-REx spacecraft begins its two-year trip to the asteroid Bennu. On arrival at Bennu, OTES will provide spectral data for global maps used to assess potential sample sites. It will take thermal infrared spectral data every two seconds and will be able to detect temperatures with an accuracy of 0.2 degrees Fahrenheit. It also will detect the presence of minerals on the asteroid’s surface. The OSIRIS-REx Camera Suite (OCAMS) consists of three cameras that will image the asteroid Bennu during approach and proximity operations. Scientists and engineers at the UA’s Lunar and Planetary Lab designed and built OCAMS to image Bennu over nine orders of magnitude in distance, from one million kilometers (more than 620,000 miles) down to two meters (6.5 feet). PolyCam, the largest camera of the OCAMS suite, is both a telescope — acquiring the asteroid from far away while it is still a point of light — and a microscope capable of scrutinizing the pebbles on Bennu’s surface. MapCam will map the entire surface of Bennu from a distance of three miles, and the Sampling Camera, or SamCam, is designed to document the sample acquisition. The OCAMS instrument suite is scheduled to be installed on the spacecraft in September. The OSIRIS-REx Laser Altimeter, or OLA, will scan Bennu to map the entire asteroid surface, producing local and global topographic maps. OLA is a contributed instrument from the Canadian Space Agency. 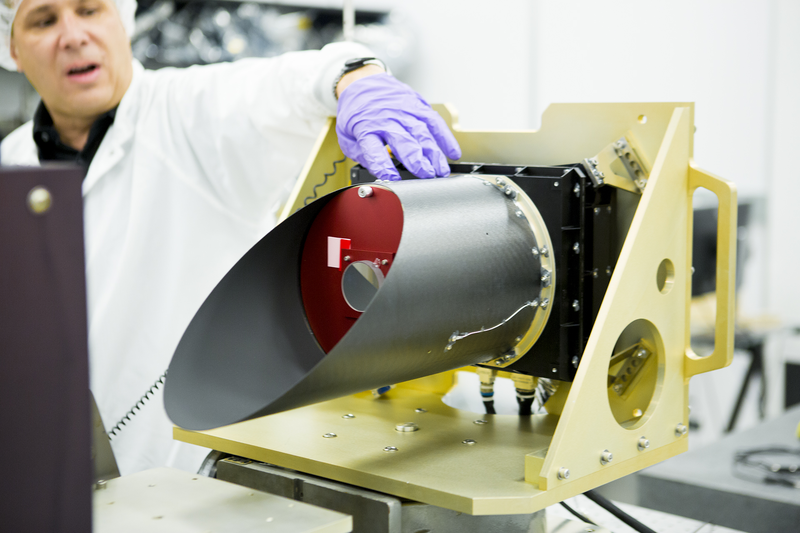 The OSIRIS-REx Visible and Infrared Spectrometer, or OVIRS, measures visible and infrared light from Bennu, which can be used to identify water and organic materials. The instrument is provided by NASA’s Goddard Space Flight Center. A student experiment called the Regolith X-ray Imaging Spectrometer, or REXIS, will map elemental abundances on the asteroid. REXIS is a collaboration between the students and faculty of the Massachusetts Institute of Technology and Harvard College Observatory. “The next few months will be very busy as we begin integrating the instruments and prepare for the system-level environmental testing program to begin,” said Mike Donnelly, OSIRIS-REx project manager at NASA’s Goddard Space Flight Center in Greenbelt, Maryland. NASA’s Goddard Space Flight Center provides overall mission management, systems engineering and safety and mission assurance for OSIRIS-REx. The UA’s Lauretta is the mission’s principal investigator. Lockheed Martin Space Systems in Denver is building the spacecraft. OSIRIS-REx is the third mission in NASA’s New Frontiers Program. NASA’s Marshall Space Flight Center in Huntsville, Alabama, manages New Frontiers for the agency’s Science Mission Directorate in Washington, D.C.
With launch only 15 months away, the team of the OSIRIS-REx asteroid sample return mission, led by the University of Arizona, is preparing to deliver its instruments for integration with the spacecraft over the next several months. OSIRIS-REx, which stands for Origins Spectral Interpretation Resource Identification and Security-Regolith Explorer, is the first U.S. mission to take a sample from an asteroid and bring it to Earth for study. OSIRIS-REx will travel to Bennu, a near-Earth asteroid, to bring back a small sample to Earth for study. The mission is scheduled for launch in September 2016. The spacecraft will reach its asteroid target in 2018 and return a sample to Earth in 2023. The spacecraft will carry five instruments from national and international partners. These instruments will be key to mapping and analyzing Bennu’s surface and will be critical in identifying a site from which a sample can be safely retrieved and ultimately returned to Earth. The OSIRIS-REx Camera Suite, or OCAMS, consists of three cameras that will image Bennu during approach and proximity operations. Scientists and engineers at LPL designed and built OCAMS to image Bennu over nine orders of magnitude in distance, from 1 million kilometers (more than 620,000 miles) down to two meters (6.5 feet). PolyCam, the largest camera of the OCAMS suite, is both a telescope — acquiring the asteroid from far away while it is still a point of light — and a microscope capable of scrutinizing the pebbles on Bennu’s surface. MapCam will map the entire surface of Bennu from a distance of three miles, and the Sampling Camera, or SamCam, is designed to document the sample acquisition. The OCAMS instrument suite is scheduled to be installed on the spacecraft in September. The OSIRIS-REx Thermal Emission Spectrometer, or OTES, will conduct surveys to map mineral and chemical abundances and to take Bennu’s temperature. OTES is provided by Arizona State University. NASA’s Goddard Space Flight Center in Greenbelt provides overall mission management, systems engineering and safety and mission assurance for OSIRIS-REx. Lockheed Martin Space Systems in Denver is building the spacecraft. OSIRIS-REx is the third mission in NASA’s New Frontiers Program. NASA’s Marshall Space Flight Center in Huntsville, Alabama, manages New Frontiers for the agency’s Science Mission Directorate in Washington, D.C.